Elan Daley was back in the water competing in the Ontario Junior International Swim Meet at the Toronto Pan Am Sports Center Competition Pool. Thirteen year old Daley was competing in the 18 & Under Age Group event that attracted a total of 85 Senior teams including England, Scotland, Japan and various national Canadian teams. Both Daley’s 50m Freestyle times would break the Bermuda National Record times. Daley’s 50m Freestyle time of 25.98 was faster than Madelyn Moore’s time of 26.12 she set back on March 19th, 2015, she would go faster later in the final when she was clocked at 25.97. 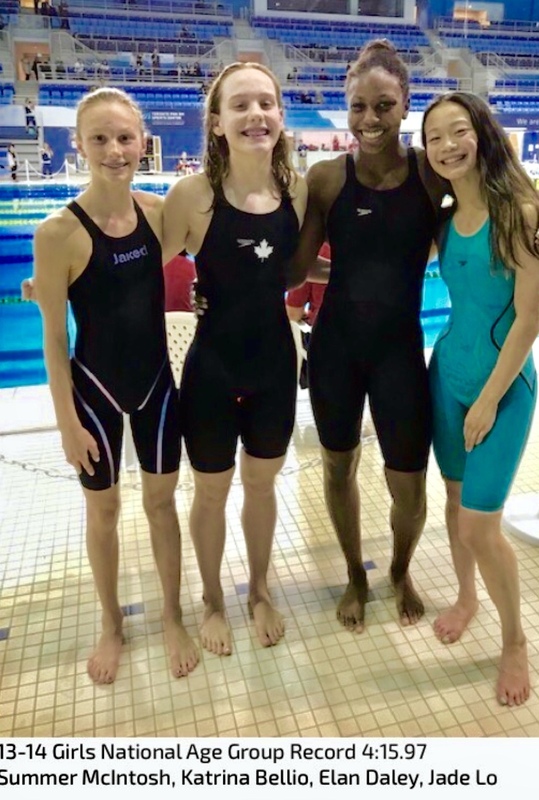 Daley anchored in a 4x100m Medley Relay team swimming the Freestyle and had to beat her own Personal Best time and swim a 55.6 to get the Canadian National Record for her team. She beat her best time touching the wall clocked at time of 55.35 which is just .13 off the Bermuda Open Age Group Record currently held by Kiera Aitken and has stood since 2009. Daley would clock a time of 55.82 during the 100m Freestyle which is also faster than the current Bermuda Age Group Record time of 57.49 set by Moore on March 21st, 2015 and Daley’s time is also an Ontario Provincial Record.